The stock air filter housing on the 4.0 XJ has an 8.5cm x 6.0cm opening at the front to allow fresh air into the engine. For a 4.0 liter engine that is expected to rev to 5250rpm, this is hopelessly small. It's like trying to breathe through a straw! Even with the K&N 33-2018 replacement panel filter, breathing is still restricted. The airbox is also made of black plastic. 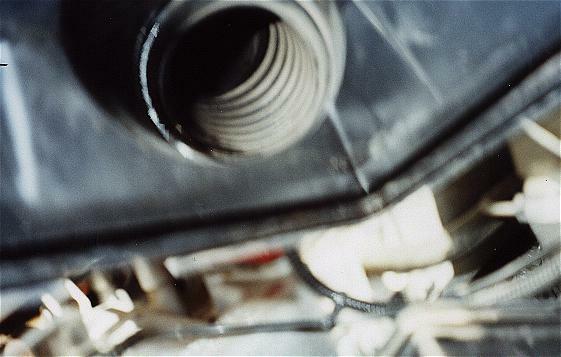 The corrugated airtube running from the airbox lid to the throttle body is made of black rubber. These become very hot under normal running conditions. As a result, the air inhaled by the engine is pre-heated. Hot air is less dense and the engine makes less horsepower (horsepower loss is 1% per 11*F increase in intake air temperature). The tube exiting the airbox lid has a trumpet-shaped baffle that reduces intake noise. It also restricts airflow by narrowing the airtube to 4.8cm in diameter at that point. In the next section, I will describe how I modified my air intake to improve airflow and to reduce intake air temperatures. The result is better throttle response and more horsepower/torque. I followed the technique used by the "Project MPG" team for their optimum intake configuration in their comparison of various intake configurations. Here are the links to their results. They make interesting reading. I cut off the front opening tube, enlarged the hole by 50% and stuck on another black plastic rectangular tube that's 50% bigger (9.0cm x 8.5cm). Then I removed the plastic bug shield from between the radiator and the driver's side headlamp housing to allow more cool air in. I cut away the metal that surrounded the original intake tube, made a plastic "trumpet", and put it on the end of the larger front opening. The intake now inhales cool air rushing in next to the radiator when the vehicle is travelling forwards. This is the "ram air" effect that many muscle cars try to exploit. 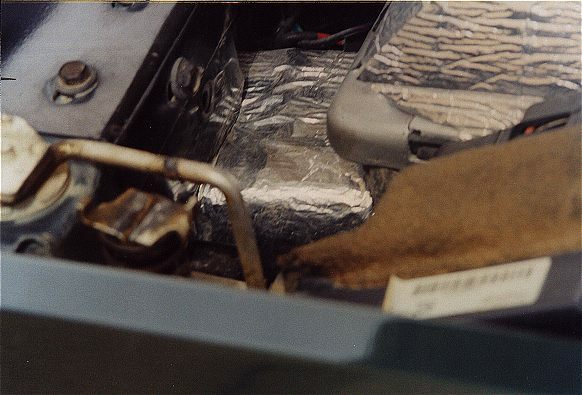 I insulated the airbox and tubing by using a windshield sun shade (the one with the aluminium foil on the outside). I cut it to shape and wrapped the whole airbox and tubing. I stuck it down using stick-on velcro, making it easy to remove again. I also zip-tied it to the tube from airbox to throttle body for extra security. This is a very cheap and effective mod. A windshield sun shade and velcro costs peanuts compared to a roll of DEI Cool Tape. The trumpet-shaped baffle has gone. Removing it is easy. Pull the corrugated airtube off the airbox lid, then slide out the baffle from that side. The inside of the corrugated airtube is 7.6cm (3.0in) in diameter without the baffle. Airflow to the throttle body is much better as a result. 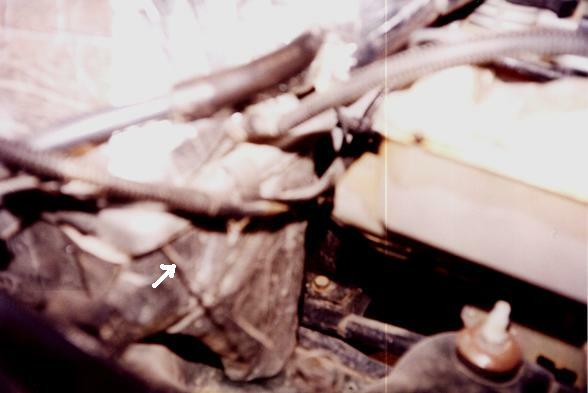 I have a temperature probe stuck inside the rear wall of the airbox. The electrical lead leaving the rear left corner of the airbox (sandwiched underneath the K&N panel filter) goes to a dash mounted thermometer where I can monitor intake air temperature. 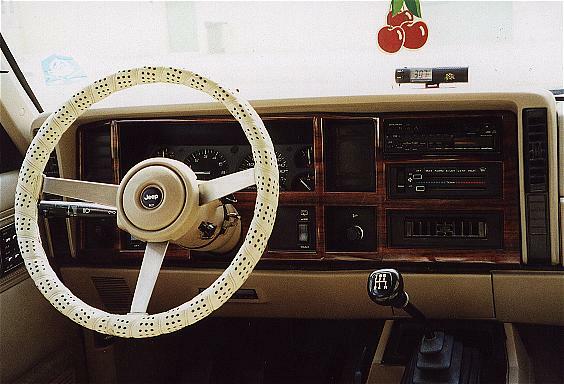 Mounted on top of the dashboard. It can measure temperature both in *C and *F. At any speed over 25mph, intake air temperature is now the same as the ambient temperature due to the "ram air" effect. 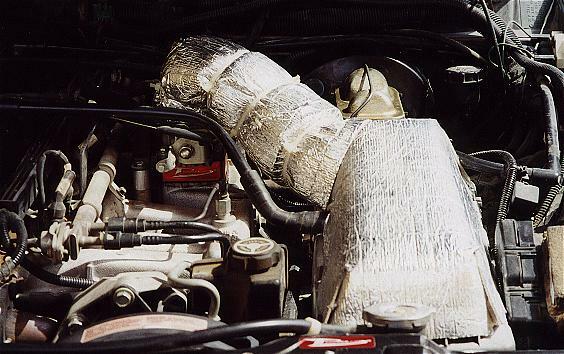 When you consider that underhood air temperatures can be as much as 50*F higher than the ambient air temperature, my engine is now making up to 5% more horsepower in the real world (hood closed) than an equivalent engine breathing hot underhood air.